Sandwich bread (also referred to as sandwich loaf) is bread that is prepared specifically to be used for the preparation of sandwiches. Sandwich breads are produced in many varieties, such as white, whole wheat, sourdough, rye, multigrain and others. 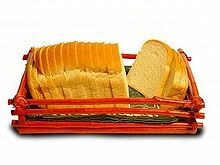 Sandwich bread may be formulated to slice easily, cleanly or uniformly, and may have a fine crumb (the soft, inner part of bread) and a light texture. Sandwich bread may be designed to have a balanced proportion of crumb and crust, whereby the bread holds and supports fillings in place and reduces drips and messiness. Some may be designed to not become crumbly, hardened, dried or have too squishy a texture. Sandwich bread can refer to cross-sectionally square, sliced white and wheat bread, which has been described as "perfectly designed for holding square luncheon meat". The bread used for preparing finger sandwiches is sometimes referred to as sandwich bread. Pan de mie is a sandwich loaf. Some sandwich breads are designed for use in the creation of specific types of sandwiches, such as the submarine sandwich. For barbecuing, use of a high-quality white sandwich bread has been described as suitable for toasting over a fire. Gluten-free sandwich bread may be prepared using gluten-free flour, teff flour. and other ingredients. In the 1930s in the United States, the term sandwich loaf referred to sliced bread. In contemporary times, U.S. consumers sometimes refer to white bread such as Wonder Bread as sandwich bread and sandwich loaf. Wonder Bread produced and marketed a bread called Wonder Round sandwich bread, which was designed to be used with round-shaped cold cuts and other fillings such as eggs and hamburgers, but it was discontinued due to low consumer demand. American sandwich breads have historically included some fat derived from the use of milk or oil to enrich the bread. Some companies and restaurants, such as Subway, bake bread that is specifically used for the preparation of sandwiches. Pepperidge Farm produces breads designed and marketed to be used in sandwich preparation. Nature's Pride is another brand that has produced sandwich bread. Bonn Group of Industries, a food company based in Ludhiana Punjab, India, produces a product called Super Sandwich Bread. Some supermarket chains, such as H-E-B, produce their own store brands of sandwich bread. Some mass-produced sandwich breads are sliced before being packaged, while others are packaged unsliced. Some companies, such as Nissen, also produce sandwich rolls. In 2012, the New Jersey State Fair/Sussex County Farm and Horse Show held The Fleischmann's yeast "Sensational Sandwich Bread" contest, in which contestants submitted their homemade sandwich bread prepared using Fleischmann's Yeast. Breads were judged under the criteria of appearance, flavor, texture, sandwich filling and creativity. The contest included cash prizes and state and national grand-prize winners. ^ a b c Mercuri, B. (2009). American Sandwich. Gibbs Smith, Publisher. p. 9. ISBN 978-1-4236-1192-9. ^ a b Baking Industry. Clissold Publishing Company. June 1, 1922. p. 1107. ^ a b c "Bridor Launches Soft Artisan Sandwich Bread Line – Restaurant News". QSR magazine. November 4, 2014. Retrieved April 30, 2015. ^ a b c d Rubel, William. "Basic Sandwich Bread Recipe". Mother Earth News. Retrieved April 30, 2015. ^ Reinhart, P. (2010). Peter Reinhart's Artisan Breads Every Day: Fast and Easy Recipes for World-Class Breads. Potter/TenSpeed/Harmony. p. 109. ISBN 978-1-60774-086-5. ^ Reinhart, P.; Manville, R. (2011). Peter Reinhart's Whole Grain Breads: New Techniques, Extraordinary Flavor. Potter/TenSpeed/Harmony. ISBN 978-1-60774-130-5. ^ Pitzer, S. (1980). Baking with Sourdough: Storey Country Wisdom Bulletin A-50. Garden Way Publishing bulletin. Storey Publishing, LLC. p. 11. ISBN 978-1-60342-407-3. ^ Rombauer, I.S. ; Becker, M.R. ; Becker, E.; Guarnaschelli, M. (1997). JOC All New Rev. – 1997. Scribner. p. 744. ISBN 978-0-684-81870-2. ^ Roberts 2008, p. 158. ^ a b c Palmatier, R.A. (2000). Food: A Dictionary of Literal and Nonliteral Terms. ABC-Clio ebook. Greenwood Press. p. 312. ISBN 978-0-313-31436-0. ^ Juan, M.J. (2011). Diccionario práctico de gastronomía y salud: Con más de 5.000 entradas, recetario, refranero y dichos populares del autor (in Spanish). Editorial Díaz de Santos, S.A. p. 1383. ISBN 978-84-9969-037-7. ^ Steves, R. (2014). Rick Steves' Spain 2014. Rick Steves. Avalon Travel Publishing. ISBN 978-1-61238-674-4. ^ Roberts 2008, p. 156. ^ Mauer, D. (2006). The Complete Idiot's Guide to Grilling. The Complete Idiot's Guide. DK Publishing. p. 276. ISBN 978-1-4406-9671-8. ^ Keough, K.E. (2009). Sugar-free Gluten-free Baking and Desserts: Recipes for Healthy and Delicious Cookies, Cakes, Muffins, Scones, Pies, Puddings, Breads and Pizzas. Ulysses Press. p. 88. ISBN 978-1-56975-704-8. ^ Katzinger, J.; Barnard, K. (2012). Gluten-Free and Vegan Bread: Artisanal Recipes to Make at Home. Sasquatch Books. pp. 83–85. ISBN 978-1-57061-834-5. ^ Bread, W.; Gong, L. (2007). The Wonder Bread Cookbook: An Inventive and Unexpected Recipe Collection from Wonder. Cookery, Food and Drink Series. Ten Speed Press. p. 9. ISBN 978-1-58008-807-7. Retrieved April 30, 2015. ^ James, Susan Donaldson (February 5, 2014). "What's in Your Sandwich? Subway Takes Out Plastic Chemical". ABC News. Retrieved April 30, 2015. ^ Sosland, Josh. "Dynamic bread market shows bakers sharpening elbows for shelf space". Food Business News. Retrieved April 30, 2015. ^ "White Calcium Enriched Sliced Sandwich Bread". Pepperidge Farm. Retrieved April 30, 2015. ^ Ojeda, Louis Jr. (May 5, 2010). "HEB recalls wheat sandwich bread". KXXV-TV News Channel 25. Retrieved April 30, 2015. ^ Bittman, M.; De Salve Villedieu, O. (2014). How to Cook Everything Fast: A Better Way to Cook Great Food. Houghton Mifflin Harcourt. p. 137. ISBN 978-0-470-93630-6. ^ Milling and Baking News. Sosland Pub. 1987. Retrieved April 30, 2015. Quote: "Nissen gounnet sandwich rolls, eight per package and in poppyseed, sesame, plain and com meal varieties..."
^ a b c "Entries sought for sandwich-bread contest". KWWL. June 5, 2012. Archived from the original on March 4, 2016. Retrieved April 30, 2015. Roberts, A.G. (2008). Gluten-Free Baking Classics. Agate Publishing, Incorporated. ISBN 978-1-57284-640-1. Wikimedia Commons has media related to Sandwich bread. Pashman, D.; Meyer, A.E. (2014). Eat More Better: How to Make Every Bite More Delicious. Simon & Schuster. pp. 78–79. ISBN 978-1-4516-8975-4. Calvel, R.; MacGuire, J.J.; Wirtz, R.L. (2013). The Taste of Bread: A translation of Le Goût du Pain, comment le préserver, comment le retrouver. Springer US. p. 111. ISBN 978-1-4757-6809-1. "Sandwich Bread". The Dallas Morning News. December 15, 2010. Retrieved April 30, 2015. "White Sandwich Bread". Cook's Illustrated. April 1, 2006. Retrieved April 30, 2015. This page was last edited on 1 June 2018, at 08:27 (UTC).